If your business is geared to get somewhere quickly, set up and produce live events—then move on to the next project—don’t burden it with a bunch of extra equipment, setup time and cost. The most streamlined of our professional models, TriCaster 410 delivers live to air, display, stream, record, and social media network—all at the same time. Its mobile, 2U form factor provides uncluttered I/O in any combination of resolutions and frame rates, trims the workflow andthe equipment expenditure to fit your live business, and slims down on the post-production extras. Don't worry. Your shows will look anything but small. 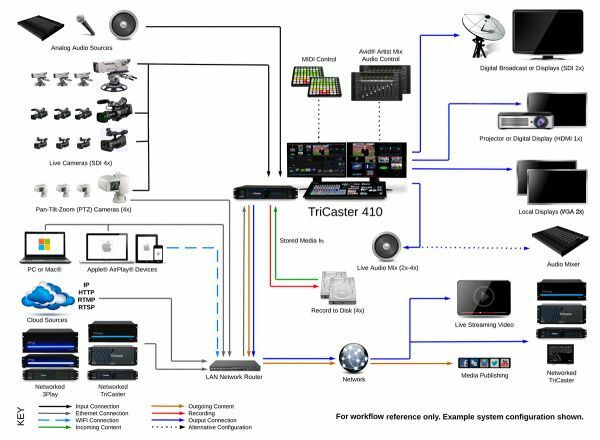 TriCaster 410 integrates every production component you need to produce sophisticated, multi-camera events and deliver them live to any screen. It then goes even further to deliver super-charged visuals, generated by the most powerful switcher-effects engine available. Like 3D holographic virtual sets. Mix/effect banks that extend your submix and switching capabilities by a factor of four. Multi-channel media delivery with simultaneous streaming and social media publishing. And a slew of productivity-enhancing tools that let you focus on all the action between fade up and fade to black. 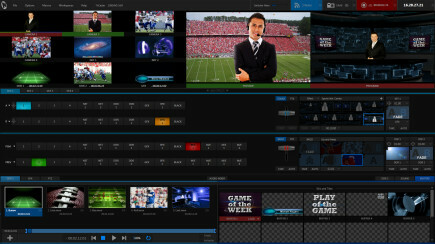 video mixerMix live cameras and video feeds with stored content, like video clips, still images and graphics; plus network sources, layered compositions and live virtual sets, to create compelling, television-style programs. previewEstablish viewer-friendly pacing and flow between camera angles and content sources, with a look-ahead preview window that lets you see how your next shot will appear before you take it live to air. overlaysEnhance your presentation with titles, graphics, animations and picture-in-picture video, layered over live cameras and content. Display information, identification, branded elements, and supplemental media for maximum visual communication with your audience. Expand creative possibilities for your production. In Mix mode, M/Es can use program/preview transitions and overlay to create full-featured sub-mixes. In Effect mode, create multiple video layers for real-time compositing, or transform your green screen setup into an elaborate virtual set. Adjust any M/E input source, DSK or Key layer to fit your exact needs. Move full-screen or keyed layers around within the shot frame, scale assets up or down to size appropriately, rotate for added effect, and crop to clear away any unnecessary part of an image. Custom animated transitions and content builds help you achieve polished, post-production styling in real time. mixer levelsConfigure audio levels and settings for every source and signal; including stereo output mixes and the deepest, most flexible, and precise control of any switcher-based audio mixer. mixandmatchUse any combination of supported digital or analog audio devices, including microphones, mixers and sound systems, to deliver top-quality audio. Manage TriCaster's audio levels and select settings from the palm of your hand, with a free iPad® audio mixer app. Touchscreen actions sync directly with the TriCaster audio mixer for tight control. Add an audio operator to your crew to focus solely on sound. Every TriCaster supports the Avid® Artist Mix audio control surface (sold separately) to provide hands-on control over audio levels and configuration options. AFVSimplify even the most complex A/V setup by selecting any video source to automatically trigger the appropriate audio selection. Breakout audio control to an external mixer, feeding the sound outputs from TriCaster, to a hardware console for dedicated management by a member of your crew. audioroutingEvery conceivable audio distribution combination with independent routing of any channel from any input, to any and all audio output mixes. independent delayCompensate for sync issues with incoming video from mixed cameras with the ability to adjust the audio delay for every input. Listen and adjust more accurately, with the ability to toggle Solo setting on or off. Audition any single source or output channel, with both exclusive and latch operation options. Pan control on every channel creates a rich, layered sound experience. TriCaster makes it easy for you to keep sources straight, use your own naming conventions, and simplify adjustments. network inputsConnect TriCaster to a local network and tap into a wealth of compatible devices and destinations, instantly expanding available content sources to add to the mix in real time. 2 live network inputs each support multiple selections. playback cloudAccess virtually limitless video sources and content applications as video sources, with the ability to connect to Cloud-based media, IP cameras and streaming servers through network inputs. airplayTurn every one of your wireless iOS devices - iPad, iPhone®, iPod® - into an input source. media playbackLoad and playback both long and short-form video clips, packages and motion graphics. An extensive range of file formats allows you to work with essentially any media asset, and use multiple playlist presets to keep files organized. tittlesAdd extra depth to your on-screen presentation with built-in titling. Introduce your talent with a creative nameplate, identify on-air visuals with lower-thirds, and provide important information for viewer consumption. TriCaster includes a variety of templates to suit any show, and you can even build your own. playlistEasily accommodate revisions to the show rundown or new content without missing a beat by making changes and updates to media player playlists during showtime. Every preset bin can be accessed and reorganized on the fly, even playing back content from one playlist, while editing on another. graphicsOrganize, load and access photos, images, full-screen and partial-screen graphics in TriCaster media players and have them on-screen in an instant. soundsAudio files from music bed to sound effects can be loaded into their own dedicated TriCaster media player for playback during live production. Access up to 15 additional media sources - instantly - during live production. View and manage buffer content directly inside the integrated multiviewer, including animation preview (in some models) and, incredibly live title editing. One small software client replaces a full scan converter setup to bring computer sources into TriCaster. Full-screen, window, and custom-region display sharing, or local recording of on-screen content, including audio. Choose any of the standard Adobe Photoshop blending modes to combine mix/effect layers and enhance production value with more sophisticated layering, compositing, and creative effects. Optimized processing for image sampling, downscaling and warping producing high-quality video images and cleaner, better-looking video. Move between shots creatively, with hundreds of industry-standard wipes, dissolves, and more. Apply transitions both to primary sources and all DSK and Key layers for fully customizable visual presentation. Raise production values beyond any standard system, with custom-created Animation Store Transitions. Reinforce your brand with your logo or signature visuals, embedded into transitions via full-color animated overlays, along with individual sounds for transitioning in and out. Add another dimension to animated transitions with imaginative effects, like real-time cloth dynamics, 3D warping and transformations, to create a visual that will leave your audience in awe - and others wondering how you did it. With fine-tuned controls and a remarkably forgiving keyer algorithm, TriCaster's powerful, real-time keying system, LiveMatte, provides phenomenal green-screen compositing, layered effects, and virtual set possibilities with top-quality results at a fraction of the cost of dedicated chromakeying systems. virtualsetsTransform any location and raise the production value (along with the credibility) of your presentation. Each TriCaster provides professional studio sets suitable for any show - news, sports, talk, entertainment, and more - and the ability to add your own live sources to keep it real. Bring your virtual environment to life with animated virtual camera moves. Adjust shot framing on the fly with manual pan, zoom and pedestal movements, or zip from one preset shot, to another without touching the camera. Create a customized virtual environment from any real-world location. Turn panoramic images taken with your smartphone, DSLR or even point-and-shoot camera into a photorealistic virtual set, using the companion TriCaster VSE 2.5 software (sold separately). Multiple guests and presenters can share the screen simultaneously, even when they are in different locations. TriCaster includes a variety of box effects that correspond with virtual sets for a cohesive visual presentation. control surfaceTake a truly hands-on approach to running your show. Tap more intuitively and accessibly into all the capabilities TriCaster offers with its companion control surface as your live production console. macrosMake commonly used series of commands automatic, or just simplify complex ones. Record any sequence of operations as a macro event, then trigger with a mouse click, keystroke, control surface action or MIDI button—or gesture-based onscreen hotspots. snapshotsConfigure your setup of a particular scene just the way you need it for any scenario, then fire every macro action, simultaneously to snap to it automatically, organizing and automating your show down to the finest detail. hotspot symbolTurn on-screen areas into interactive controls and let your talent trigger macros with live motion - even run your one-person show from in front of the camera. A wave of a hand or a walk to a mark, and the next action sequence happens automatically. Make automation of your show even easier or breakout control tasks to additional crew with TriCaster's extensive MIDI support. Add one or any number of MIDI devices that fit your application and budget, assign macros to controller buttons, and provide dedicated control over video operations - even meshing them with live performance elements like sound, lighting, effects, and more. autoplayIncrease the efficiency and accuracy of your production with instant automatic playback. Clips and content play right on cue whenever you press the applicable switcher or M/E button, meaning zero delay when taking a video or image. Save time reproducing your painstaking macros from scratch. Tweak to your exact specifications, editing the action, timing and order, as needed, to ensure automated operations run smoothly and accurately. TriCaster automatically locates and populates session media, even when drive settings have changed - saving valuable time typically spent searching for missing media and rebuilding sessions, and lessening the burden on operators to maintain a large volume and assortment of assets. Create basic highlight clips for instant playback and publishing with shortcut commands that insert the last 4 seconds of program output into your choice of DDR playlists, the Publish queue, or both. Go end-to-end with zero signal degradation. TriCaster processes signals at their native resolution, meaning no in-between down conversion or up conversion that can affect image quality. Configure once, then produce that program to those exact specifications every time. TriCaster supports live production in all industry-standard interlaced and progressive scan formats up to 1080p, with a variety of frame rates to choose from. Observe incoming camera feeds, media sources and output without an expensive, space-eating bank of monitors. You can even customize your workspace to align with your preferred view of the action. Individually customize each multi-view preview monitor, adjusting on the fly for fine-tuned workflow or simply for observation. Real-time feedback in the form of color-coded visual indicators provides live cues while a production is in progress. Easily see which cameras are currently on-air, how long before a clip finishes playing, the active M/E, and more. Built-in waveform monitor and vectorscope displays allow you to calibrate your signals to be broadcast-compliant and perform other valuable tasks, such as matching color characteristics of multiple cameras. clocksKeep tabs on production time with a primary clock matched to the current time code, as well as a secondary countdown clock matched to the custom-configured Start and End times, and hit every mark your show needs to hit. syncWork with a wide range of video sources, while eliminating concerns about signal timing, thanks to TriCaster's internal Frame Sync. If your setup requires ultra-low latency, such as IMAG, you can toggle Frame Sync off (genlock required). Connect external tally lights or similar devices used for visual cues, and allow talent and crew to see the input currently selected on the Program row of TriCaster. Choose the thumbnail image that represents a clip in DDRs and the Media Browser, including distinctive, individual thumbnail images for duplicate clips. Drive up to four local monitors and video screens — the User Interface and Multi-view displays, plus two video-only display ports for additional monitors or projectors. Each display port features advanced scaling, frame-rate processing, and an independently selectable output signal, increasing flexibility for multi-screen monitoring and output. Set up and store session settings in reusable templates to jump right to your custom configuration during pre-show activities. proc amp controlsMake subpar sources look better—and all of them perfectly consistent. Adjust color characteristics and levels for input sources: brightness, contrast, hue and saturation, as well as White Balance settings, provide a quick-fix for visuals and boost the look of your brand. A timesaver on every level. Configure M/Es, LiveSet shots, transitions, media players and more with your most frequently used setups and content. Presets include multiple slots for instant access to your preferred assets, even while live. per-asset configurationFine-tuning at your fingertips. Adjust every camera input, stored source, virtual set, clip and transition to your specifications. From positioning and speed controls, to sound levels and color correction, TriCaster's configuration options are extensive, easy-to-use, and customizable to your particular needs. Layering, external CG, images, graphics—even off-board chromakeying systems—any source that has an alpha channel can pair with another source (whether intenal or external) to add depth, remove color backgrounds, and create layered effects. Use the UI to link switcher and M/E source rows together in color-coded groups to streamline your simultaneous actions on multiple sources and multiple outputs. Make instant, accurate adjustments and fewer mistakes. Configure TriCaster's secondary output as the alpha matte for key/fill purposes with downstream devices. timecodeTime productions out, and scrub through recorded QuickTime� files quickly and easily with timecode support. Every TriCaster can generate a local timecode from the internal system clock, while TriCaster 8000, 860 and 460 also support an external linear timecode (LTC) reference. real timeproductionTriCaster's high-performance system architecture supports layer upon layer of live video, the most powerful switcher-based effects engine available, and universal file format support—blurring the lines between live production efficiency and post-production polish. media importImport Media module enables batch import of files with optional transcoding, and automatically categorizes and distributes incoming files to the appropriate locations for production use. All media formats apply. TriCaster will play them. media exportOptimize stored media files for virtually any post-production purpose, with a versatile Export Media module that converts files into the most appropriate format or formats for their next destination, ready for use before they even leave TriCaster. media browserFamiliar interface to browse and select content, transitions and effects while providing intuitive organization and filtering for efficient, effortless asset retrieval. file formatWork with virtually any file format during your live show, and virtually any platform, operating system or non-linear editor for post-production workflows. Add local or shared ISO recordings to DDR playlists and the Publish queue while recording is in progress. Trim, playback or export even as recording and live production continues for instantaneous access to content being captured - locally or remotely - for playback, publishing or postproduction. Export active ISO recordings to local storage or FTP while recording is in progress - and let postproduction staff begin working with recorded content as soon as the program begins to reduce turnaround time. Record multiple channels of video direct to disk with independently selectable file format on all channels, and effectively eliminate racks of recording and transcoding equipment. Capture multiple versions of program output simultaneously or retain multi-camera source footage for archive or post-production use. source recordRaw footage can be a critical component of post-production activities. TriCaster gives you the option to designate an individual camera input for capture, allowing you to record the content you need in its entirety, then use it however you see fit. The Add to Playlist record panel command enables instant turnaround of in-show content, making recorded clips available for immediate playback from DDR playlists. recordGo live or on-demand. Choose your preferred format, then record your entire program to a full-resolution video file, which you can archive, store and distribute for later playback, or upload to the Web. Recording specialized submixes of your live production that you can repurpose at will. Set your record source to any M/E, and capture an alternate cut of your live show, an uninterrupted feed of a select composition, or even an identical program with different branding. encoding formatsFor every TriCaster recording channel available, you can take your pick from among various QuickTime, MPEG-2, AVI, H.264 and MP3 selections, saving valuable time in the transition from live, to post. The hub for all of your streaming activity, the Streaming Profile Manager gives you direct access to configuration settings, presets, and an in-system Web browser to get your live stream up, running, and out to the world. web browserConnect, test, preview and monitor your live stream using the built-in Web Browser. See the stream as your audience sees it without leaving the system, or having to rely on a secondary workstation. TriCaster automatically writes every live stream to a Web-ready video file, making it easy to post online for on-demand viewing, or archive immediately following the live event. Launch live streaming video of your show to the Web with simultaneous archive, at the touch of a button. TriCaster includes presets for the most common streaming profiles, in resolutions up to 720p, with support for custom multi-bitrate stream profiles. Produce and record content in HD and SD simultaneously, with configurable output resolutions. projectorSupply an output signal from your show to a projector, scaling system or display to present to an in-house or local audience. Produce a multi-camera show and send the primary feed from the main switcher for live output and audience consumption. Double your output and audience opportunities by switching two shows simultaneously, or producing a secondary feed for post-show repurposing, with the ability to output an M/E submix. broadcast outputSupply an output signal from your show for transmission over the air for your audience to view. social mediaTake over second and third screens with built-in social media sharing. Real-time publishing instantly links you with all of your social networks - like Facebook, Twitter, and YouTube - so you can share, distribute, and engage instantly, even when you don't have a dedicated social media producer on site. Duplicate and transfer saved files and recordings for internal and external distribution, getting content to the people that need it, more quickly and efficiently. Prepare recorded files for publishing, creating in and out points on the frames of preference, and then uploading to the desired destination for internal use or external viewing. Create the bigger, professional-looking studio you've always wanted, without construction costs or even floor space. Virtual Set Editor 2.5 software lets you customize live virtual sets and load them into TriCaster to enhance every program, captivate your viewers, and dramatically raise your production value-no matter how small your studio space is, or what it looks like. speed hqConvert any file into a TriCaster-friendly format with the included SpeedHQ codec pack. With this free download, you can outfit every workstation in your facility with the ability to deliver files that are a better fit for live playback. Brand your show the way every major network does by building custom title templates and graphics to unmistakably identify your program. Use the built-in LiveText CG application, and you can use TriCaster to keep them updated live. Everything you need to make a professional-looking program packed into a single system: multi-camera switching, live webstreaming, recording, video playback, titles, graphics, audio mixing, virtual sets, animated effects and everything on this page, built into one compact frame without all the additional setup time, complex cabling and cost. 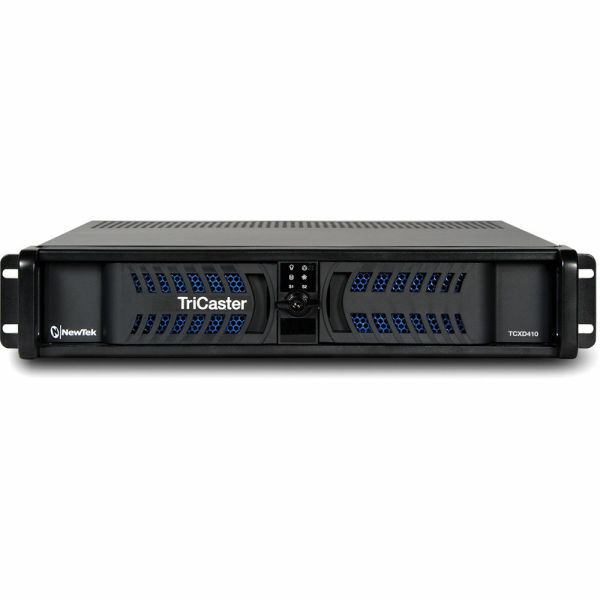 rack mountIndustry-standard 2U and 4U rackmount chassis mean you can install your professional TriCaster model into any production environment with ease. Slide TriCaster into the rack to replace racks of other equipment, or to work alongside your current workflow. Control robotic PTZ (pan-tilt-zoom) cameras directly from the User Interface, including camera orientation, zoom, focus and iris. Position presets with thumbnail preview make it easy to set up shots remotely and change angles on the fly. multi tieredFor added protection and safeguarding, TriCaster includes multiple ''Always on Air'' features that create a multi-tiered redundant fail-safe system that keeps your live production in tip-top shape, with minimal disruption even in the face of catastrophe. mix matchGo with new video cameras and get the most out of your existing inventory. Each TriCaster supports HD and SD digital cameras, with resolutions and frame rates freely configurable for each live video input. back uprestoreRun your production operation with a safety net. Easily restore factory defaults, or create a bootable clone of TriCaster's system drive on another hard drive inserted into one of the removable drive bays, or connected externally. TriCaster intelligently detects connections between 3Play output channels and network inputs, providing automatic tally configuration for TriCaster-3Play workflows and reducing the risk of mistakes happening on air. Direct integration between TriCaster and 3Play enables cross-platform commands and automation (via macros) for remote operation of select 3Play functions. Build custom command programs and consolidate control between TriCaster and 3Play - reducing the number of operators required, and simplifying sophisticated, multi-system workflows. updates upgradesTriCaster systems incorporate a "check for updates" function to ensure your system has the most current support. In addition, NewTek provides highly competitive upgrade pricing and the most generous trade-up offers available. Contact your local reseller for more details. Save TriCaster hardware inputs for live cameras, and feed auxiliary TriCaster and 3Play systems in over the network. When connected to the same local network, your TriCaster can see all other TriCaster and 3Play systems and can accept their output signals as input sources through the network inputs. Create a live production ecosystem around TriCaster, thanks to a growing list of organizations and developers using NewTek's SDK program to produce partner solutions. Developed specifically for TriCaster, these partner solutions can help you create more efficient and compelling workflows for your show.